Turn any faucet into a shower! 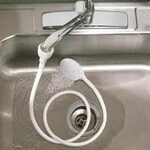 Spray hose for sink is ideal for washing hair, filling humidifiers, watering plants, with long 48" hose. Faucet hose sprayer cleans pets without costly grooming fees. Vinyl hose has styrene head, rubber connector.